Scientists claim to have found the most compelling evidence yet that the Universe went through a faster-than-light expansion in its first moments. Can we start at the beginning - the Big Bang Theory (BBT)? Many people will be familiar now with the dominant theory in cosmology - that our observable Universe emerged from an incredibly small, incredibly dense space, presumably in some quantum process, and then expanded outwards. Our studies of the oldest light in the sky - the famous cosmic microwave background (CMB) - indicate this event occurred some 13.82 billion years ago. On some levels this idea seems fantastical, but when we look deep into space, it makes sense. The American astronomer Edwin Hubble showed us that the galaxies are rushing away from each other, and that the further you look, the faster they recede. Run the "movie" backwards, and everything must have been much closer together in the past. But the earliest moments are certainly hard to grasp, and scientists themselves confess that the further back you go, the more difficult the physics is to describe and comprehend. So how does inflation fit in? It's an "add on" to BBT. It proposes that about a trillionth of a trillionth of a trillionth of a second after our observable Universe got going, it went through a super-rapid expansion, taking an infinitesimally small patch of space to something about the size of a marble, before then continuing to coast outwards. (Note: space may open up faster than light, but nothing in it is moving faster than light). One of the pioneers of inflationary theory, the American Alan Guth, describes inflation "as sort of the bang in the Big Bang". And it fixes some puzzling aspects in BBT. For example, it explains why the Universe looks so smooth on the largest scales. Inflation would have stretched away any unevenness. It also explains the structure we see in the Universe - all those galaxies and clusters of galaxies. The random quantum fluctuations that existed before inflation would have been amplified to provide the seeds for everything that came after. But how do you prove this kind of thing? Inflationary theory came with a prediction - something the experimentalists could test. It was hypothesised that the very rapid expansion would have been accompanied by waves of gravitational energy, and that these ripples in the fabric of space-time would have left an indelible mark on the CMB. Gravitational waves alternately squeeze and stretch space as they pass through it. And the primordial waves associated with inflation would likely have changed the orientation of the oldest light in the Universe. In other words, it would have polarised this light. This being the case, it should be possible to detect a very characteristic "twist" in the CMB, provided the signal is large enough and the investigations are sensitive enough. A telescope at the South Pole, operated by the Background Imaging of Cosmic Extragalactic Polarization 2 (BICEP2) project, has now claimed to have done this. If confirmed, what does this mean? Assuming the observations are correct, it's a huge result. It represents our most direct detection yet of gravitational waves. That alone might be Nobel Prize-winning territory. 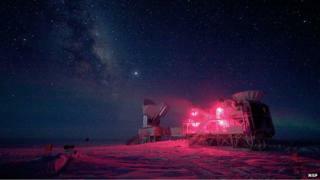 But beyond that, this is a huge step for the study of the origin of the Universe. Inflation has always involved some highly speculative physics. So free was the hand of theorists that they were able to dream up literally hundreds of different models for how inflation might have worked. They can't do that anymore. The size and shape of the signal claimed by BICEP2 means many of the more exotic models will now go straight in the bin. Importantly, the discovery gives scientists an energy scale for inflation. The physics they develop to describe inflation must now fit inside that parameter. The good news is that the energies implied by BICEP2 are consistent with ideas for what is termed Grand Unified Theory. This is the realm where particle physicists believe three of the four fundamental forces in nature can be tied together.